I write about the Internet. I spend roughly 10 hours a day (or more) on the web. I stream movies, music and use IP communications to talk to sources, friends and family. In short, I demand a lot from my broadband connection. 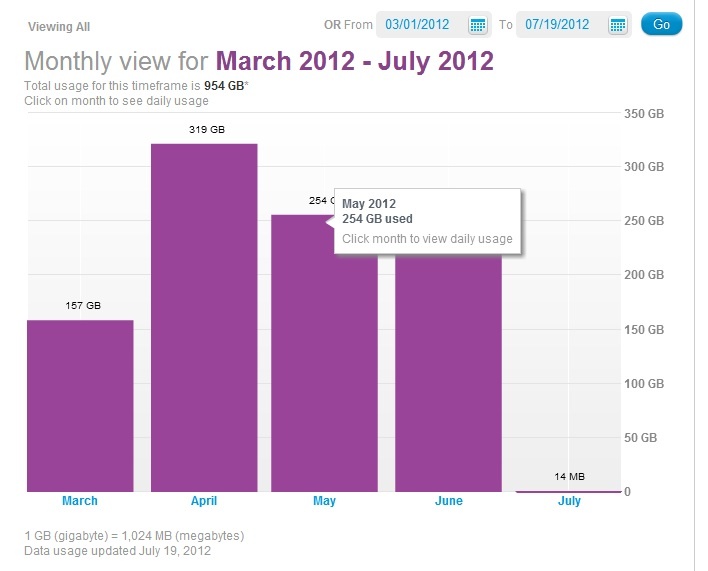 But still, I was surprised to see I use 125 gigabytes of data a month, according to Time Warner Cable, my ISP. And that got me wondering: How much do my parents use? My friends? The little old lady down the street? For better or worse, over half of those who subscribe to broadband in the U.S. are under some form of bandwidth cap, which means that many have a meter and can now track how much data they use. So I asked people to send me their usage as well as answer a few questions. This is not any kind of scientifically valid sample and I know those who shared their data are more technically savvy that others, but I invite our readers to send in their data to help me get a better picture. I think that once people realize that between the little, old lady who uses her broadband connection to check email and someone illegally uploading every episode of Game of Thrones there are a bunch of families and households in the middle, that broader picture of broadband usage in this country can help us debate the caps, mergers and whatever other policy issues that come into play with everyone in mind. 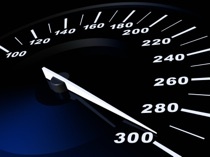 So, meet five bandwidth users from around the country. Notes: I have not had a landline or cable/satellite since 2001 and have no plans to go back. 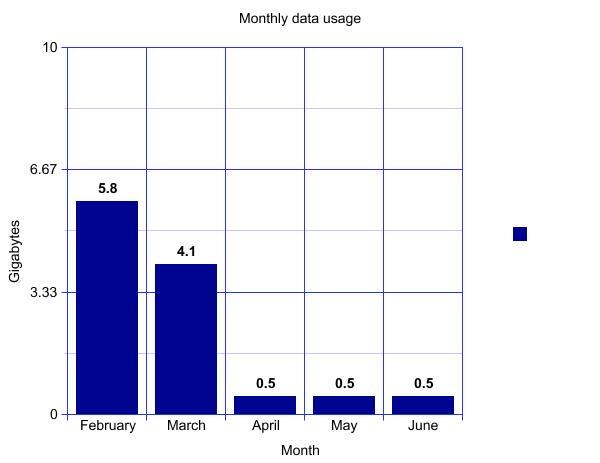 In a typical month I use 3.5 GB, but I hit my peak consumption in February when I was obsessively watching Downtown Abbey online to catch up on seasons 1 and 2. I pay for unlimited mobile broadband (which is actually limited to 6 GB), but I never even get close to that. Notes: We rent a fair amount of movies each month, either directly from Comcast or from Apple. Also we go on Netflix (s nflx) binges when something good comes on or we discover a new TV show. In June we watched two seasons of The League in a single week, which might explain the jump. Notes: We watched two movies in June using Netflix. Household: Two adults in their mid-forties and 3 kids aged 10, 12, and 14. Notes: We rent all movies from Apple TV and we subscribe to five TV shows over Apple TV. Every person except our 10-year-old is a heavy social media user and big into personal videos and photos. I don’t buy it that a purely legitimate usage home that >also< subscribes to cable TV can use 320GB and 254GB in back-to-back months. They are either part of a botnet that they are unaware of, torrenting, or doing something else… It's very, very, very hard to consume that much data. Watching 5 series shows a bunch of movies on AppleTV is nowhere near enough data to push the envelope that far. 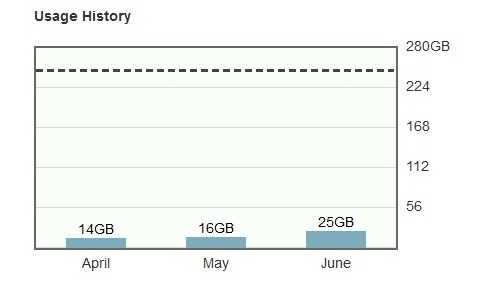 Yea, so, i dont now where they get that the “average” user uses only ~20GB or less per month, because as a single user, with legal torrents and netflix, and amazon prime, and many other legit streaming and downloading sources(hulu, ect), even with cable TV, I still manage to use over 800GB+ per month, and have for the last 2 years(router logs to prove). I think they “exclude” heavy users from their stats just to influence how they appear. Since my ISP does not track usage, but imposes a cap, i have to track it myself, and have never gotten a complaint from them. 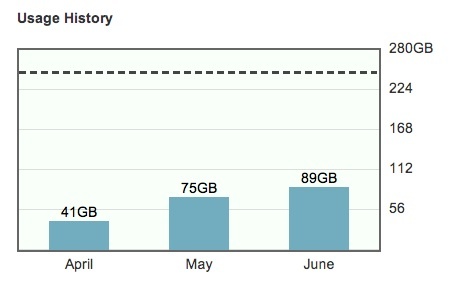 More regularly, I go closer to 1TB per month, and sometimes go over that. 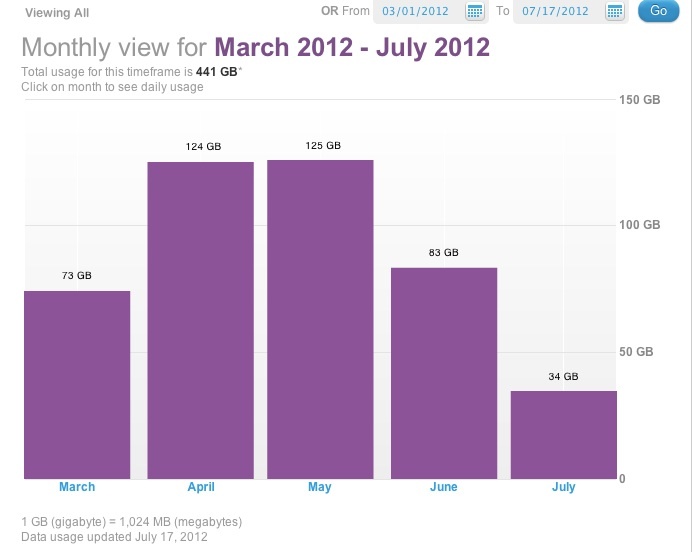 Highest in the last 12 months is 2.3TB, and lowest is 599GB. Gaming, and streaming add up, and as quality increases on streaming, so too will the amount of data they consume. Fun fact: Did you know that the more data you use, the less per GB it actually costs your ISP? per a recent reports, ISPs only pay between $0.01 and $0.03 per GB depending on how much is used. The reason they want a low cap and overage model is pure cash grab, since if they billed you for “actual” usage, at an acceptable rate(meaning their costs plus a small reasonable profit), they would only be making $0.10 per GB at most, that means for my 1000GB, I would only be paying $100 per month, but that granny who only checks her email and uses 1/2 a GB, would only have a few dollar bill. If they want Usage Based Billing, they would not make any money, and profits would fall. This cap plus overage model is a pure cash grab, even in the wireless sector. Fancy that! Someone actually alluded to declining marginal cost; something that seems to have disappeared from this industry over the past 15 years. Do I hear someone saying Moore’s and Metcalfe’s laws? Say it ain’t so! interesting to see so many legitimate users.. I don’t know anyone who ‘pays’ for digital media.. but I did read Australia has the highest number of pirates per capita.. perhaps its to do with our heritage? Or maybe really long content windows?